The LIT History Series is for the Legends, Innovators, and Trailblazers that have shaped our culture. I love history, and in turn, I love Black history. So much of our culture has been defined by those who've come before us, so I write this to capture and chronicle our narratives. So much is going on these days regarding America's national anthem, but let's take a moment to talk about the black national anthem, Lift Ev'ry Voice and Sing. 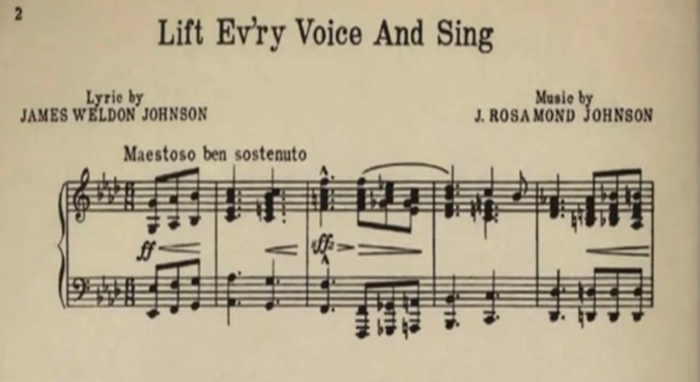 Photo: PBS Lift Ev'ry Voice and Sing was written as a poem by James Weldon Johnson and set to music by his brother John Rosamund Johnson in 1899. It was first performed in public as part of a celebration of Lincoln's Birthday in 1900 by a choir of 500 schoolchildren at the segregated Stanton School, where James Weldon Johnson was principal. Johnson was a civil rights leader, lawyer, activist, diplomat, poet, and one of the leading figures in the creation of the Harlem Renaissance. After writing Lift Ev'ry Voice and Sing, both he and his brother wrote more than 200 songs for Broadway musicals. Johnson published hundreds of stories and poems during his lifetime including God's Trombones (1927) and The Autobiography of an Ex-Colored Man (1912), which made him the first black-American author to treat Harlem and Atlanta as subjects in fiction. He retired from the NAACP in 1930, and in 1934, Johnson became the first African-American professor at New York University. Lift Ev'ry Voice and Sing was adopted by the NAACP as its official song and is one of the most cherished songs in the black community, also known as the black national anthem. Read the lyrics in full. Lift every voice and sing Till earth and heaven ring, Ring with the harmonies of Liberty; Let our rejoicing rise High as the listening skies, Let it resound loud as the rolling sea. Sing a song full of the faith that the dark past has taught us, Sing a song full of the hope that the present has brought us, Facing the rising sun of our new day begun Let us march on till victory is won. Stony the road we trod, Bitter the chastening rod, Felt in the days when hope unborn had died; Yet with a steady beat, Have not our weary feet Come to the place for which our fathers sighed? We have come over a way that with tears has been watered, We have come, treading our path through the blood of the slaughtered, Out from the gloomy past, Till now we stand at last Where the white gleam of our bright star is cast. God of our weary years, God of our silent tears, Thou who has brought us thus far on the way; Thou who has by Thy might Led us into the light, Keep us forever in the path, we pray. Lest our feet stray from the places, our God, where we met Thee, Lest, our hearts drunk with the wine of the world, we forget Thee; Shadowed beneath Thy hand, May we forever stand. True to our God, True to our native land.